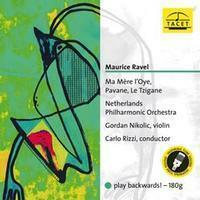 Violinist Gordan Nikolic joins the Netherlands Philharmonic Orchestra conducted by Carlo Rizzi for this performance of Ravel's Ma Mere l'Oye on this unique LP that PLAYS BACKWARDS!!! There are hundreds of pieces of music that can be played backwards – so-called palindromes. But nobody has ever seen a long-playing record that plays backwards. Until now that is! The present LP is Tacet's latest production – a company that is always good for surprises regarding recording techniques. Unlike a 'normal' LP the needle is put down at the lead-out groove and moves outwards. Behind this apparent gag is nothing other than the wish to achieve the very best sound possible with the general awareness that music often begins softly and ends loudly. A great pity that this phenomenon is not taken into account when employing the usual cutting technique, for the further the pick-up arm moves towards the centre, the more information has to be stored per groove centimeter with a constant revolution speed. The result: with an increasing level of sound the high notes tend to suffer from distortion. In order to demonstrate that this undesirable effect can be compensated, the director of Tacet, Andreas Spreer, chose to put Ravel’s Boléro – one of the direst examples of dynamics – to the test. The result is 16 minutes of excitement and brilliant sound, which escalates with every millimeter that the needle progresses along the groove to its final climax. Well, leave it to the Germans to come up with this solution to the fact that many classical works of a quarter-hour or so length begin rather quietly and build up to a great climax at the end, while mastering them on standard LPs starts at the outside edge (where there is the best frequency response and least distortion) and ends near the center label where there is the most frequency dropoff and possible distortion. This problem has concerned mastering engineers for some time. So Mr. Tacet, engineer Andreas Spreer, decided to master these two recordings the way some radio transcriptions have been mastered in the past: the grooves going from the inside label to the outer edge instead of the other way ‘round. Thus if you still have a record changer (horrors!) or some type of semi-automatic tonearm on your turntable, you may not be able to play this special disc. Otherwise there’s no problem with the freely-moving tonearm going from the inside grooves to the outside instead of vice versa. Makes a lot of sense. Spreer has even given the album the overall title of “oreloB” to make his point. There are loads of notes inside both the double-fold sleeve and on the back, but those in English fail to reveal if the original recording for this disc was digital or analog. What is it that makes "tube sound" what it is? The advantages of tubes over transistors are difficult to describe in technical terms. Perhaps the reference to the higher and different type of distortion with tube amplifiers is most applicable, although "distortion" has a rather negative meaning: the more distortion, the worse it is. So this can't be entirely right. Besides, the distortions of these microphones of 1947 are much too slight to be really noticeable. The recording of the Partitas of Johann Sebastian Bach with Florin Paul is, for me, although meanwhile almost 23 years old, still the best example in our TACET catalogue of the special quality of tube microphones. The two U 47 microphones by Neumann made their contribution. For the LP, however, (except for rare exceptions, justified for musical reasons) the signal is even stored on a tube tape recorder and then mastered with valve equipment, so that one would be right in saying that for the entire production not a single transistor was used. Features:• 180g Vinyl • Designed To Play Backwards!